Watergate revealed a trail of crimes and coverups that brought down a president and changed the course of American history. With Robert Mueller's findings likely to be unveiled soon, what can we learn from Watergate about Trump-era abuses of power? John Dean, who was President Nixon's White House counsel, and Elizabeth Holtzman, who as a member of the House Judiciary Committee voted to impeach Nixon, discuss. Brennan Center Live is a weekly series of podcasts created from Brennan Center events, featuring fascinating conversations with well-known thinkers on issues like democracy, justice, race, and the Constitution. America has five percent of the world’s population, but nearly a quarter of its prisoners. Now, a dynamic movement for change is sweeping the country. CNN host Van Jones and Ford Foundation president Darren Walker on how to keep the momentum going. New York Times best-selling author Carol Anderson speaks with Cornell Brooks about her new book on racist voter suppression and the fight against it. Anderson focuses in particular on the drive to weaken the landmark Voting Rights Act, and argues that voter suppression ultimately aims to make its targets lose faith in democracy itself. Ensuring that doesn’t happen could hardly be a more urgent task. As crucial elections approach, voters from Georgia to North Dakota to Texas are at risk of disenfranchisement, and the result could be further skewed by extreme gerrymandering. Meanwhile, automatic voter registration could expand access to the polls in several states. How will the battle over voting shape the midterms, and what can we do to make sure every eligible American has a chance to cast a ballot? Hear from several of America’s top voting rights lawyers — Dego Adegbile, Julie Ebenstein, Brenda Wright, and the Brennan Center’s Sean Morales-Doyle — on the most urgent issue facing our democracy. How did we lose an entire generation to the American prison system following the War on Drugs? In Cuz, The Life and Times of Michael A., the Harvard professor and political theorist Danielle Allen explores the issue through the experience of her cousin, who served 11 years in prison for an attempted carjacking committed when he was 15, then lost his life to violence three years after being released. Allen is joined in conversation by the Brennan Center’s Nicole Austin-Hillery. Donald Trump poses a grave, long-term threat to our democratic institutions, Atlantic senior editor and former White House speechwriter David Frum has been warning. But, in this wide-ranging conversation with NYU Law School president Trevor Morrison, Frum argues we need to focus not just on Trump’s own behavior, but on “the system of power that enables him.” And Frum explores the ways in which America’s potential retreat from democracy under Trump mirrors developments around the world. Mass incarceration is among the nation’s greatest moral and racial injustices. We have five percent of the world’s population, but nearly a quarter of its prisoners. In recent years, a dynamic movement for change has swept across the country. How will it survive the current political climate? Every ten years, the federal government conducts the census of all people in the United States. The stakes are extraordinarily high, particularly in light of the push to include questions about citizenship. The tally determines everything from the allocation of congressional seats and the shape of legislative districts, to the flow of vast amounts of government funds. Political pressure is especially high this time, as demographic change transforms the country. In all, it's a potential crisis looming ahead – with huge ramifications for civil rights and government policy for years to come. How could budgetary constraints, new and untested technologies, and potential political interference create obstacles to an accurate count? What are the steps engaged organizations and individuals can take to increase the likelihood of a successful census? Join civil rights leader Vanita Gupta, President and Chief Executive Officer of the Leadership Conference on Civil and Human Rights, Wendy Weiser, Director of the Democracy Program at the Brennan Center for Justice at NYU School of Law, Thomas Saenz, President and General Counsel of the Mexican American Legal Defense and Educational Fund, and Joseph J. Salvo, Director of the NYC Department of Planning's Population Division, to unpack the many questions and challenges of the upcoming census. They will spotlight work that litigators are doing to bolster the health of the census and ensure the decisions that will impact our society in political and economic ways are made are based on honest and accurate calculations. The courts have proven a key battleground in the fights of the Trump era. On immigration, voting rights, freedom of religion and more, legal advocates are taking on federal policy – and, often, winning. What are these new legal strategies? Will they last? And how can issues of democracy, justice, and the rule of law become burning matters of public – not just legal – debate? Reverend Dr. Martin Luther King, Jr., is largely remembered for his campaigns against segregation, his calls for racial brotherhood, and his unwavering commitment to nonviolence. He is less often remembered, however, for his fervent opposition to increasing global militarism, his all-consuming desire to eradicate poverty, and his vision for a transformed and truly participatory democracy. 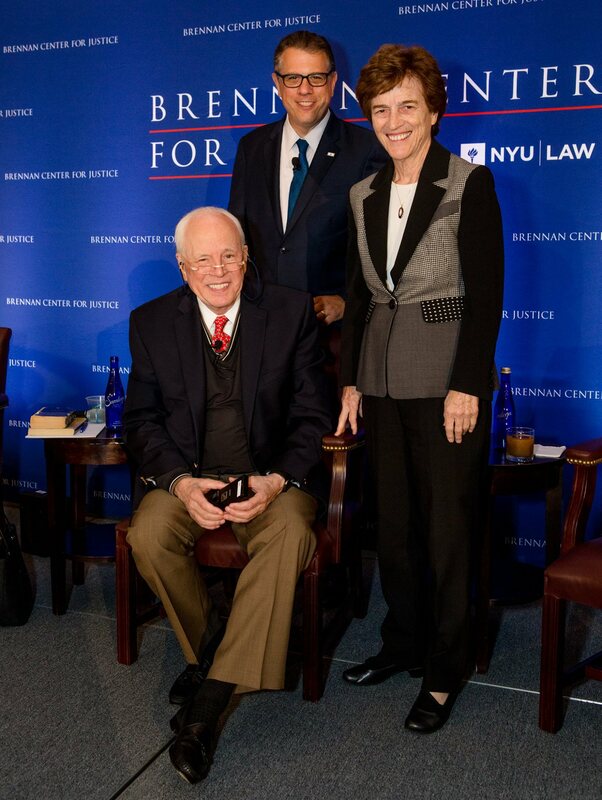 Fifty years after his assassination, former Rep. Donna Edwards and former Republican National Committee Chairman Michael Steele, in conversation with the Brennan Center’s Ted Johnson, will reflect on King’s life and examine the expansion of his activism from 1967 to 1968. Who was King at the end of his life? What is his lasting impact on issues of poverty, war, and democracy? And what must we do to bring about the revolution of values he envisioned? This program is produced by the Brennan Center for Justice in partnership with the NYU John Brademas Center and NYU Washington, DC. There are a shocking 2.2 million Americans behind bars right now, but how can we cure America of its epidemic of mass punishment? Leaders across the criminal justice movement share an array of reform ideas, including improving prison conditions, creating effective youth re-entry programs, changes to the parole model, alternatives for mental health and drug addiction issues, and models of new industries to replace the prison economy. Speakers include Nicole Zayas Fortier, counsel at the American Civil Liberties Union, Robin Steinberg, founder of the Bronx Defenders, and Judith A. Greene, a former Soros Senior Justice Fellow and criminal justice expert, both contributors to Decarcerating America, The New Press volume, edited by Ernest Drucker. Big data has produced big change. As anyone with a phone knows, technology has exploded – and created startling amounts of data about our lives. How is this information tracked and stored, and how does that affect our rights? Algorithms trained on big data have transformed law enforcement and social services. Cash-strapped governments have proven especially eager to use automated tools. Some claim to predict crime “hot spots” and even individuals at risk. Others recommend whether to detain or release defendants before trial. And some assign children to schools and families to shelters. All these automated computing tools today play a larger role than ever before. Fans praise these as better than fallible human judgment. But do they live up to their promise? How to judge claims by the companies who stand to make money off them? Can we really achieve transparency and efficiency? Do big data tools, as some charge, simply reinforce class and race prejudice under the guise of objectivity? Can these systems be harnessed for good? And how can affected communities gain control over how data is used and packaged? With social media on the rise, living standards stagnating, and fears of multiethnic democracy growing, voters are discontent with politics. Across the world — from India to Turkey to the United States — authoritarian populists have seized power. In his new book, Yascha Mounk examines how trust in the political system is dwindling as money in politics soars and democracy wanes. How did we get here, and how can we protect democracy moving forward? Yascha Mounk, Lecturer on Political Theory at Harvard University and author of the new book The People vs. Democracy: Why Our Freedom Is in Danger and How to Save It,discusses the future of democracy with Wendy Weiser, Director of the Democracy Program and the Brennan Center for Justice. In an extraordinary and relevant conversation, legendary television journalist Bill Moyers — who served as one of President Lyndon Johnson’s top aides during the civil rights era — will discuss the epochal events of the “Second Reconstruction.” He will be joined by two leaders of the current fight for democracy and veterans of courtrooms across the country in the fight against voter suppression — Kristen Clarke of the National Lawyers' Committee and Myrna Pérez of the Brennan Center's Democracy Program. This event is part of Carnegie Hall’s The ’60s: The Years that Changed America festival. Considered one of the most influential justices to ever serve on the U.S. Supreme Court, Antonin Scalia left behind a complex legacy as a conservative legal thinker and disruptive public intellectual. A vivid writer known for caustic dissents, Justice Scalia was crucial to reshaping jurisprudence during his three decades on the bench. According to Richard Hasen, author of the new book The Justice of Contradictions, Scalia’s jurisprudence and confrontational style disrupted the American legal system, delegitimizing opponents and leading a conservative renaissance on the Court. Join Richard Hasen — professor at University of California, Irvine and one of The National Law Journal's 100 most influential lawyers in America — as he delves into the complicated legacy of Justice Antonin Scalia. He will be interviewed by leading legal journalist Joan Biskupic, author of the definitive biography of Justice Scalia. Citizens United. Hobby Lobby. Many Americans had not heard of the movement to expand constitutional rights for businesses before these landmark cases. But the struggle for corporate rights has a long, complicated history in the United States. The first Supreme Court case extending constitutional protections to corporations was decided in 1809, more than a half-century before the first comparable cases for racial minorities or women. In the years since, the nation’s most powerful corporations have gained our most fundamental rights, transforming the Constitution to serve the ends of capital. Join Adam Winkler, law professor at UCLA and author of the new book We the Corporations, for a discussion about the American government’s relationship to big business and the 200-year effort to give corporations the same rights as people. He will be joined by Dahlia Lithwick — one of the country’s most prominent legal journalists — an editor at Slate and host of its Amicus podcast — who covers the Supreme Court and its decisions on corporate rights. In partnership with the American Constitution Society. When can a democracy slide into autocracy? In his provocative new book, Trumpocracy, conservative writer David Frum examines the ways in which Trump and his administration continually undermine our most important public institutions. As Frum argues, Trump has steadily damaged many of the tenets and accepted practices of American democracy in just his first year of presidency, including media freedom, judicial independence, and the right to have one’s vote counted fairly. David Frum is a Senior Editor at The Atlantic, the author of nine books, and served as a special assistant and speechwriter for President George W. Bush. In this special conversation with NYU School of Law Dean Trevor Morrison, a leading expert on the presidency and the Constitution, Frum will discuss what happens next under Trump, as well as how to prevent a push toward illiberalism. President Donald Trump’s decision to keep control of his business empire despite apparent conflicts of interest is but one of a number of ethical controversies that have made headlines since Inauguration Day one year ago. As informal guardrails that constrain self-dealing by those in power fall away, what can be done to shore up federal ethics laws to give the public confidence that their leaders will put the interests of the American people first? The panel reviews the most significant gaps that exist in our system of federal ethics regulation, considers the special challenges that accompany any effort to regulate the president’s conduct in office, and debates the most promising ideas for reform. Join the Brennan Center’s Jennifer Weiss-Wolf, author of Periods Gone Public, and Malaka Gharib, Deputy Editor and Digital Strategist of NPR's Goats and Soda, to learn more about how this campaign emerged, why the issue resonates across party lines, and what is next for “menstrual equity.” Gretchen Borchelt of the National Women's Law Center and Congresswoman Grace Meng, (NY-6), sponsor of the Menstrual Equity for All Act of 2017 (H.R. 972), will introduce the conversation. Katy Tur—who recently received a Walter Cronkite Award for Excellence—joins the Brennan Center and Irin Carmon, co-author of Notorious R.B.G., to reflect on her unexpected time in the spotlight and the fascinating, highly controversial world of the 2016 Trump Campaign. Few journalists or scholars have seen these prisons firsthand―until now. Join Lauren-Brooke Eisen―senior counsel at the Brennan Center for Justice―for the launch of her new book, Inside Private Prisons, as she reflects on her unprecedented access to our nation’s private penal system and what she’s uncovered about these corporate prisons. She will be joined by criminal justice journalist Eli Hager from The Marshall Project, investigate journalist Eric Schlosser (Fast Food Nation), Khalil Cumberbatch from The Fortune Society, and NPR correspondent Ailsa Chang. In an otherwise treacherous political era for women’s bodies and health, activists and lawmakers are advancing a new, affirmative agenda – for the very first time, one that meshes menstruation and public policy. From tax reform to public benefits to corrections policy, periods have become the surprising force fueling a high-profile, bipartisan movement. Join the Brennan Center and New York Immigration Coalition for a discussion on extreme vetting, the Muslim ban, and the implications for American democracy and society. A deeply personal memoir that critiques the American prison system, Danielle Allen’s Cuz: The Life and Times of Michael A.tells a coming-of-age story born of the tragedy of mass incarceration. Her fifteen-year old cousin Michael was arrested and tried as an adult for attempted carjacking. Dropped into the Los Angeles prison system as a teenager, he served eleven years before returning to South Central—a region racked by gang warfare—and eventually lost his life to violence just three years later. How did we lose an entire generation to the American prison system following the War on Drugs, and how can we reduce mass incarceration moving forward? Danielle Allen is a University Professor at Harvard University and the Director for the Edmond J. Safra Center for Ethics. A political theorist, she is widely known for her work on justice and citizenship in ancient Athens and modern America. Join Allen and the Brennan Center for a discussion on the “new American story”—narcotics, gangs, the War on Drugs—and the impact of the criminal justice system on the African American community in the late twentieth century. The Watergate scandal revealed a trail of crimes and cover-ups that ultimately changed the course of American politics. Forty-three years after President Nixon’s resignation, many have drawn parallels between the Watergate era and our own. What lessons can we learn that apply to today? The Brennan Center is bringing together some of the key figures from the Watergate drama. John Dean served as White House Counsel. His riveting testimony helped bring down the president. Elizabeth Holtzman, then the youngest woman ever elected to Congress, was a member of the House Judiciary Committee, which voted to impeach. Unpack what happened during Watergate and how it changed American politics with two of the main players from the era, and discuss what lessons we can draw for addressing abuse in politics today. Technology moves like lightning—so how will innovation affect our democracy and economy? Will it eliminate privacy? What tools will the military and police have, and who will control them? What are the big ideas, fantastic inventions and potentially sinister trends that will shape our future? Are we prepared for the opportunities, as well as the dangers, that await? Brennan Center contributor, Victoria Bassetti's podcast series, "The Line," examines the Electoral College. An extra session of Brennan Center contributor, Victoria Bassetti's podcast series, "The Line," examining first time voters. An extra session of Brennan Center contributor, Victoria Bassetti's podcast series, "The Line," discussing Tammany Hall. Part 3 of Brennan Center Contributor Victoria Bassetti's new three-part podcast series, “The Line,” examining voter ID laws and the myth of voter fraud with the Brennan Center's Director of Democracy, Wendy Weiser. Part 2 of Brennan Center Contributor Victoria Bassetti's new three-part podcast series, “The Line,” examining the problem of low voter turnout today and historically with Brennan Center president Michael Waldman. Part 1 of Brennan Center Contributor Victoria Bassetti's new three-part podcast series, “The Line,” examining the false claims of election rigging, how to fix low voter turnout in America, and the continued fight over voter identification laws. Control of the country is up for grabs — and the integrity of our democracy is at stake this November. Nearly two dozen states passed new voting restrictions. Gerrymandering keeps partisans in power. And the Supreme Court gutted campaign finance laws and protections against voting discrimination. In The Great Suppression: Voting Rights, Corporate Cash, and the Conservative Assault on American Democracy, MSNBC reporter Zachary Roth reveals how this movement prevents progress and quiets the political voices of people of color, students, and disadvantaged communities. A preview of Brennan Center Contributor Victoria Bassetti's new three-part podcast series, “The Line,” examining the false claims of election rigging, how to fix low voter turnout in America, and the continued fight over voter identification laws. David’s Daley’s Rat F**ked: The True Story Behind the Secret Plan to Steal America’s Democracy, is an explosive account of how political operatives undermined American democracy and fundamentally altered the electoral map through redistricting. Joined by the Brennan Center’s Michael Li, Daley will discuss how a tradition of dirty tricks – known to political insiders as “ratf**king” – was taken to an unprecedented level, and why this matters for the 2016 election. The Brennan Center held the first ever national conference on automatic voter registration. Part 2 includes the keynote speech delivered by former Attorney General Eric Holder. The Brennan Center held the first ever national conference on automatic voter registration. Part one includes a keynote speech from California Secretary of State Alex Padilla. Despite the success of last year’s surveillance reform legislation (the “USA FREEDOM Act”), the U.S. retains the ability to collect millions of Americans’ phone calls and e-mails without a warrant—and without any oversight by the Foreign Intelligence Surveillance Court—under Executive Order 12333 (EO 12333). The order underlies the intelligence community’s most expansive surveillance authorities. It generally governs the interception of electronic communications overseas, but as a Brennan Center report shows, its broad scope has significant implications for Americans. Just Security, the Brennan Center for Justice, and a panel of leading experts discussed a range of issues about the questions surrounding EO 12333 surveillance. Panelists included Neema Singh Guliani Legislative Counsel, American Civil Liberties Union; Deborah Pearlman, Associate Professor, Benjamin N. Cardozo School of Law; Rebecca Richards, Director, Office of Civil Liberties and Privacy, National Security Agency; Ames Toh, Legal Advisor to the UN Special Rapporteur on Freedom of Expression; former Counsel, Brennan Center for Justice; and Harlan Yu, Principal, Upturn. Listen to an engaging discussion with Samuel Issacharoff, one of the pioneers in the law of the political process and the author of Fragile Democracies: Contested Power in the Era of Constitutional Courts. In Fragile Democracies: Contested Power in the Era of Constitutional Courts, renowned professor and scholar Samuel Issacharoff examines the often-overlooked role of constitutional courts in transitional democracies around the world in the past 25 years since the fall of the Berlin Wall. Listen to an engaging discussion with Adam Cohen, author of Imbeciles, an exciting exposé of the American legal system. Imbeciles has been coined a "superb history of eugenics in America" by the New York Times,and the book's relevance to our current political state is highlighted in the New Yorker, stating "it's impossible ... to read 'Imbeciles' without thinking of the current election cycle." Listen to a riveting discussion by author Stephen Dycus about his new book, "Soldiers on the Home Front: The Domestic Role of the American Military." Called a “required reading for serious students of national security and responsible citizens alike” by former NSA and CIA General Counsel Elizabeth Rindskopf Parker, Soldiers on the Home Front: The Domestic Role of the American Military, coauthored by Stephen Dycus and William C. Banks, critically assesses the domestic role of the military as it is shaped by law and asks what practices must be established for the crises to come. In his new book The Parties Versus the People: How to Turn Republicans and Democrats into Americans, Mickey Edwards exposes the detrimental effects of partisanship on democracy in the United States. Reaching back to his own experience as an eight-term member of the United States House of Representatives, Edwards shows how the existing political system allows parties to control the ballot, resulting in an increasingly unrepresentative democracy. In the midst of the 2016 election, Mickey Edwards discussed solutions to fix this broken system that our Founders warned us against, and allow the people to reclaim political power. Struggling for Air: Power Plants and the "War on Coal"
The Brennan Center hosted an engaging discussion with Richard L. Revesz and Jack Lienke, authors of Struggling for Air: Power Plants and the "War on Coal." Their new book chronicles the Environmental Protection Agency's five-decade struggle to clean up the nation's dirtiest coal-fired power plants. In response to the growing influence of money in politics in recent elections, the Brennan Center hosted a workshop to discuss Professor Rick Hasen’s most recent contribution to the debate – his new book Plutocrats United: Campaign Money, the Supreme Court, and the Distortion of American Elections. He was joined by several other leading academics in the field. In We Too Sing America: South Asian, Arab, Muslim and Sikh Immigrants Shape Our Multiracial Future, Deepa Iyer draws on her work as a lawyer, civil rights advocate and academic to shed light on the post-9/11 climate in the United States, focusing on the experiences of Muslim, South Asian, Arab and Sikh communities. She writes with great insight and feeling about the young activists from these communities who are working across racial and religious lines to participate in emerging movements for racial justice such as Black Lives Matter and the undocumented youth movement. In conversation with Brennan Center fellow Mike German, John Mueller and Mark Stewart examine and evaluate the costs of the massive counterterrorism enterprise put in place since 2001, focusing on the efforts by police and intelligence agencies to follow up on over 5,000 tips flooding in each day. Mueller and Steward dive into the important questions rasied in the book: is this massive counterterroism effort necessary or effective? Or does this "ghost" chasing harm our society in ways we don't always consider when examining the impact of the terrorist threat? The U.S. Supreme Court recently heard oral arguments in a case that could radically change how legislative lines are drawn in America. In Evenwel v. Abbott, the Supreme Court might order states to draw boundaries using voters instead of total people. This change in the rule could have a significant impact on the future representation of America’s fast-growing urban and suburban communities, and of Latinos in particular. In this candid discussion, experts and practitioners explore the implications of the Evenwel case, the tremendous impact it could have on the Latino community, and how other recent Supreme Court cases could fundamentally reshape the redistricting landscape. Despite representing a significant political constituency and large consumer base, Black women remain one of the most underrepresented groups in elected office today. The Status of American Women in Politics, a forthcoming report update from Higher Heights, reiterates this discrepancy, focusing on Black women’s candidacies at the state and federal level, analyzing state/regional differences, candidate status, and electoral outcomes. The Brennan Center for Justice and Higher Heights discussed the state of representation for and by Black women in American politics today. Experts and insiders examined how underrepresented voices can make themselves heard through grassroots movements, political action, and civic engagement, ensuring that our democracy is truly and cohesively representative of the people being governed. Political parties are a core ingredient of representative democracy, but in the age of super PACs there are serious questions about whether organized parties can still provide the many democratic benefits they have traditionally furnished to our political system. Today’s climate calls for new thinking about ways campaign finance law can be used to divert money back to the parties, without exacerbating the risk of corruption or further stratifying our already unequal politics. A new Brennan Center Paper, “Stronger Parties, Stronger Democracy: Rethinking Reform,” offers a set of proposals for doing so. How did reducing mass incarceration become such a potent national political issue? Can recent controversies from Ferguson to Baltimore translate into broader policy goals? Why are presidential candidates calling for reform? How will the issue play out in lead up to the 2016 election? And – most importantly – can our leaders turn words into action? The Brennan Center’s Michael Waldman and Inimai Chettiar and the Heritage Foundation’s John Malcolm discuss. Documents disclosed by Edward Snowden and published by multiple news organizations have brought new focus to some age-old questions: what role should journalism play in the balance between the public’s right to know and the government’s need to keep secrets in the name of national security? In the so-called “information age,” how have the tools of government secrecy affected journalism – and how are journalists responding? And what is the future of the delicate relationship between those American institutions that are in the business of keeping secrets and those that are in the business of exposing them? This candid discussion about the relationship between secrecy and the fourth estate explores those questions and more. What if most of what we think we know about reading the text of the First Amendment is just wrong? For years, the Supreme Court has treated the First Amendment like a laundry list of isolated words, stopping every once in a while to pull a couple of words out of the full text and claiming to be able to use the artificially isolated words as an infallible guide to what the First Amendment really means. In Madison's Music, Burt Neuborne argues that the Supreme Court has gotten the actual text wrong. If judges would only look at the First Amendment’s full text—all forty-five words—they would discover Madison’s music, a First Amendment that is democracy’s best friend. America’s democracy is floundering, Congress is hopelessly gridlocked, and millions remain without gainful employment. Despite all this, longtime political strategist and polling expert Douglas E. Schoen remains optimistic. Democracy’s Problems And Prospects represents the best of Dr. Schoen’s distinguished career, which he has dedicated to ensuring that democratic societies reflect the consent and the will of their electorates, and that America defends its interests as well as its values. What Went Wrong with the FISA Court? The Foreign Intelligence Surveillance (FISA) Court is no longer serving its constitutional function of providing a check on the executive branch’s ability to obtain Americans’ private communications. Dramatic shifts in technology and law have changed the role of the FISA Court since its creation in 1978 — from reviewing government applications to collect communications in specific cases, to issuing blanket approvals of sweeping data collection programs affecting millions of Americans. The report's authors explore the issues with the FISA court and reforms to fix it. Darryl Pinckney’s new book, Blackballed: The Black Vote and US Democracy, is a meditation on the intersection between civil rights and the history of black participation in U.S. electoral politics. Fifty years after the first passage of the Voting Rights Act, Pinckney investigates the struggle for black voting rights from Reconstruction through the civil rights movement to Barack Obama’s two presidential campaigns. Mr. Pinckney is joined by Wade Henderson, President and CEO of The Leadership Conference on Civil and Human Rights, and Brennan's Washington D.C. office director, Nicole Austin-Hillery. What Caused the Crime Decline? This podcast examines the Brennan Center's new report that explores one of the nation’s least understood recent phenomena – the dramatic decline in crime nationwide over the past two decades – and analyzes various theories for why it occurred, by reviewing more than 40 years of data from all 50 states and the 50 largest cities. It concludes that over-harsh criminal justice policies, particularly increased incarceration, which rose even more dramatically over the same period, were not the main drivers of the crime decline. In fact, the report finds that increased incarceration has been declining in its effectiveness as a crime control tactic for more than 30 years. Its effect on crime rates since 1990 has been limited, and has been non-existent since 2000. In the last decade, national security issues have increasingly faded from the political agenda, due in part to the growth of government secrecy. In his new book, Lords of Secrecy: The National Security Elite and America's Stealth Warfare, journalist and lawyer Scott Horton explains how secrecy has fundamentally changed the way America functions. Never before have the American people had so little information concerning the wars waged in their name, nor has Congress exercised so little oversight over the war effort. Horton reminds us that publicly addressing the country’s national security concerns is the right and responsibility of a free citizenry, and ultimately, the heart of any democracy. In our first podcast, Walter Shapiro speaks with Politico’s Kenneth P. Vogel about money in politics and Vogel’s new book Big Money: 2.5 Billion Dollars, One Suspicious Vehicle, and a Pimp—on the Trail of the Ultra-Rich Hijacking American Politics. Theme music courtesy of Boy Girl Party.